President of Angola, João Lourenço. Abu Dhabi — The President of the Republic, João Lourenço, Tuesday in Abu Dhabi, United Arab Emirates (UAE) reaffirmed that the fight against corruption and impunity continue in the priorities of the Angolan Government with the focus on moralize society and improve the business environment. João Lourenço answered questions on a panel on the Future and Development of Africa with his Mali counterpart, Ibrahim Boubacar Keïta, at the opening of the Sustainable Future Summit in Abu Dhabi's sustainability week, which runs from 14 to 19 January. The Head of State said that corruption is one of the greatest ills with which the political class or part of it handled the management of the treasury, and by drag, ended up affecting the society. In this context, the Angolan President considers it essential to prioritize the reduction of economic dependence on oil, focusing on the diversification of the economy and greater attractiveness of domestic and foreign private investment, which should be directed to other branches such as industry, agriculture and technologies. 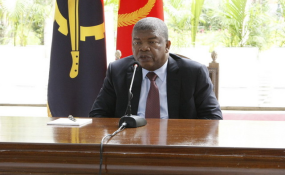 According to João Lourenço, the Angolan Government is encouraging a greater presence of the private sector and reducing excessive state intervention in the economy. In a nod to foreign investment, the President said that Angola is a country of great opportunities that in a short time created a favorable business environment. On that occasion, João Lourenço urged entrepreneurs to bet on Angola's investment and future, believing that everyone would gain from tourism, agriculture, industry or any other field. In his turn, Mali President Ibrahim Boubacar Keita pointed out the military instability as bottlenecks of the economy and praised his country's tourism potential. Meanwhile, United Arab Emirates Minister of Tolerance, Sheikh Nahyan bin Mubarak Al Nahyan, called for cooperation between various countries and peoples in the implementation of policies and programs that protect the planet. He criticized what he called ignorance that could lead to the destruction of the planet. The panel on the Future and Development of Africa is part of the Abu Dhabi Sustainability Week, which runs from 14 to 19 of this month. Among the entities present are former UN Secretary-General Ban Kimoon as well as representatives from countries such as Jordan, Morocco, Bahrain, Saudi Arabia, Lebanon, the United States, South Africa, North Korea, Japan, the United Kingdom United Kingdom, Netherlands, France, Canada and Colombia.